Mataia Homestead is a 125 year old historical homestead located on a 1400ha unique combination of a working sheep and beef farm and private nature reserve on the beautiful Kaipara Harbour. The perfect spot for families or groups looking for a quiet retreat, the homestead is situated on approximately 5 acres of gardens, including a large productive vegetable and herb garden and a heritage fruit orchard. There are a number of short and long walks through the 400 hectare private conservation reserve which is made up largely of coastal native forest margin and salt marsh wetland. This area is a great place for bird-watchers and boasts rare populations of Fernbird, Banded Rail and North Island Brown Kiwi and is host to a large number of other native bird species. The two-storey homestead features 6 bedrooms, two bathrooms, a library/television room, music room, dining room and large open plan kitchen and lounge area making it the perfect space for groups. 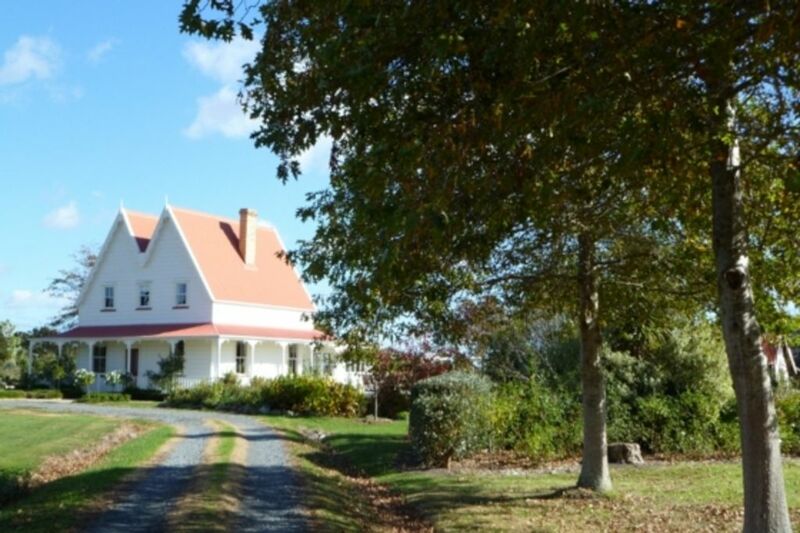 The homestead is located 15 minutes from the small village of Kaukapapa, and equidistant from three townships - Warkworth, Wellsford and Helensville (all within a 30 minute drive). Special walk packages are also available on enquiry. A standard 2 night minimum stay applies. Single nights available but compulsory linen and cleaning charges will apply to single-night stays depending on numbers. Electric blankets in winter and oil fin heaters to complement the wood fire. Wood burning fireplace in main lounge area. Basic medium - large size fridge-freezer in the kitchen and additional small bar fridge in the laundry area. Basic pantry items provided including salt & pepper, oil, flour, sugar, tea, coffee (instant & plunger) and a range of herbs and spices. All dishes and utensils needed to prepare, serve and enjoy meals for up to 12 people are provided. Full domestic kitchen with all the standard appliances. Also provided is an electric hand beater, rice cooker, electric frying pan, and a blender. Freeview only - or bring your own SKY card to plug in. Large selection of books and some children's titles. The homestead is surrounded in 5ha of park like grounds including extensive lawns, 2 ponds, a creek and numerous flower gardens, orchard, vegetable and herb gardens. 20 minutes from the Helensville Golf Course, or 30 minutes from the Wellsford Golf Course. Excellent stay. Very well kept historic homestead and garden. Wow - what a fantastic place. Exceeded our expectations. Wonderful place to stay and the bountiful vegetable garden and fresh eggs a delightful bonus. Our city kids now want chickens! Made to feel utterly welcome. Hope to return. Very comfortable stay with friends. Very comfortable stay with friends. Well cared for garden to wander around. The kitchen is well equiped. Beautiful property! We had an amazing stay and loved our time here. Beautiful property! We had an amazing stay and loved our time here. Has everything you need and the house itself and gardens are very well looked after. Would love to come back. So close to Auckland but you feel like you're far away. Thank you!